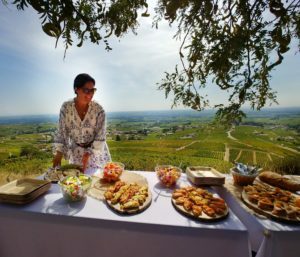 As the white stoned Madonna shone in the sun, it seemed her open arms were welcoming us to the delicious bounty of food and wine that was waiting. 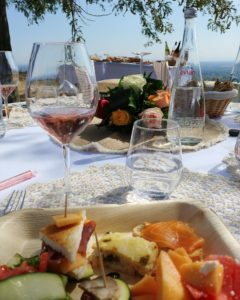 It was like a dream to be surrounded by so many tasty bites, pretty rosé wine being poured into everyone’s glass, the scent of freshly picked flowers wafting through the air and all the little details that adorned the round picnic tables… for a moment, I had to take it in… the weather was perfect, the view of vineyards down below gently sloping as far as the eye could see during a perfect day in September, and most importantly, the enthusiastic energy of my group that at one time was being challenged by the mockery of harvesters behind us as we took pictures to capture the precious moments. Those same harvesters were met with the kindness and generosity of one Anne Duboeuf, who walked over to the strangers with an authentic smile to offer them some of our food and wine with open arms like the Madonna statue I had first witnessed. 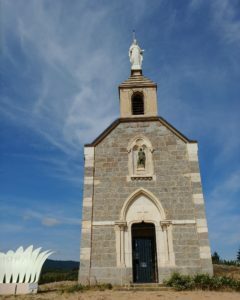 Back in September, I visited the vineyards of Georges Duboeuf, mainly focusing on the Cru wines featuring the family names of the well-regarded wine producers in various Cru communes, as that is what many of us wine writers (aka wine nerds) wanted to see, but I was taken aback by the positive economic impact that Beaujolais Nouveau, the harvest wine released on the 3rd Thursday of November, brought to the region of Beaujolais in France. It is a pretty, light red wine with red fruit, spice and a floral aroma that is ideal for a day of conviviality such as the gathering we had at the top of the hill of the La Madone de Fleurie in the Fleurie Cru of Beaujolais, France. While tasting the Duboeuf rosé, that was only sold locally, I was interested to learn that the Duboeuf Beaujolais Nouveau release would, for the first time, include a rosé that would be imbued with the same spirit as its charming red sibling. 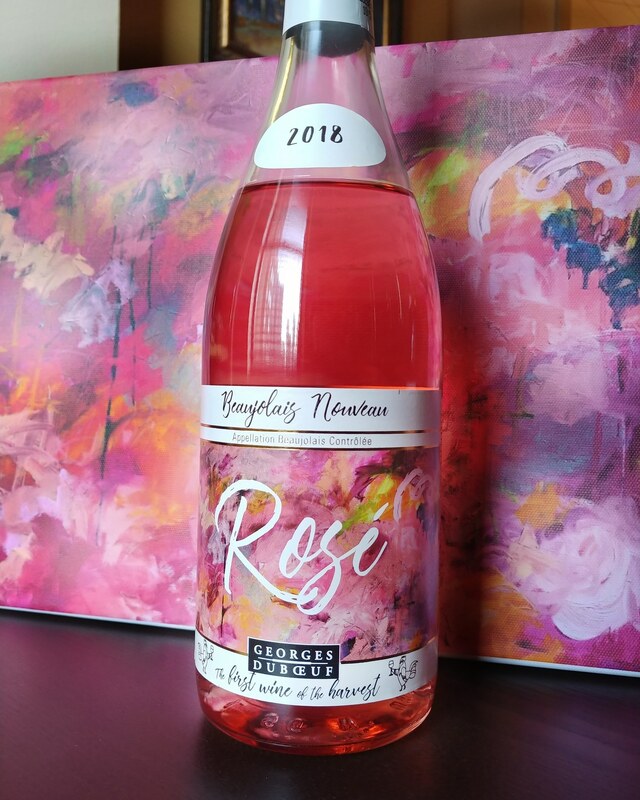 I would not be able to taste it until the rosé was released onto the market on the 15th of November of this year but I was thrilled to hear that they finally decided to make a pink Nouveau. Duboeuf didn’t make that much this year as they didn’t know how the market would receive it but they heard the world loud and clear when it was sold out to retailers before they had a chance to finish making the wine. Franck Duboeuf, who seems to be transitioning in taking over the family’s company as his father starts to take a slower pace at 85 years old (despite Franck himself insisting his father is still involved in every aspect from vineyards, to winemaking, designing labels and writing the vintage report), felt like now was the right time for the leap into Nouveau rosé. Although nothing makes more sense than making a rosé out of Gamay grapes that are made in a fresh style highlighting the fruit while keeping a dry palate to add to the fun of Beaujolais Nouveau Day, there were concerns; those concerns focused on the possible damage to the reputation of the red Beaujolais Nouveau that not only made Duboeuf’s name but allows Beaujolais grape growers to sustain a living. 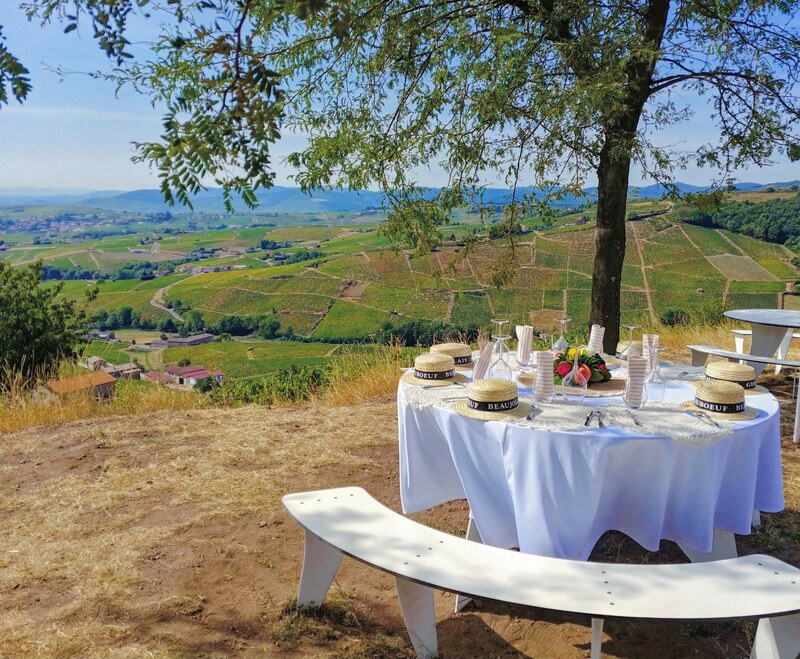 The Duboeuf family works with over 300 grape growers, which not only accounts for a lot of people alone, there are many more jobs created by the co-op wineries that work with Duboeuf as well as the Duboeuf winery itself that are all mainly sustained by Beaujolais Nouveau. There is nothing romantic about the idea of giving many local people the chance to pay their bills without having to leave the place where they grew up. And the idea that Beaujolais Nouveau is an accessible wine that makes no bones about being a wine for everyone to celebrate together without any pretense, or lacks complicated lingo that we wine nerds love to decode, has made it a target for those who want to go off on a rant on why more people are not drinking “more interesting” wine. And I point the finger at myself and my own rants in the past. But as we see information coming back showing that we are moving into a wine market where there is no real loyalty in wine purchases and the younger generation seems to want to buy what they haven’t had or what is different (don’t get me wrong I am happy that this is happening), we are moving into an unforeseeable future within the wine world, and if we are not careful it will only be the tiny, obscure and the conglomerate companies that will exist while the medium sized companies, many times the ones bolstering communities, fall by the wayside. But it is just so easy to go after medium companies because there are real people running them that don’t have the manpower or team of lawyers to go after ever defamation of character like the conglomerates. The most interesting thing about meeting Georges Duboeuf, as well as his son Franck, was the fact that both men had a quiet intelligence as well as a deep connection to the many people in the Beaujolais area where they both lived and raised their families. When someone bashes Nouveau in front of Georges he gets very serious, and in a way hurt, as it is the wine that he not only loves for its pure expression, and its connection to the history of celebrating harvest in the region, but it has made so many things possible for a long list of neighbors he can name within a heartbeat. As we wake up and look at the news everyday in the US, in the UK, in France, we see worlds that are being torn apart because too many people on the extreme sides of a multitude of topics are tearing down the companies and way of life that so many depend on. I do believe in progress, and am happy to see it in so many ways, but when we start to chip away at those companies, or organizations, that are creating something that brings joy to a lot of people while giving a means of steady income to those who live outside the cities, we really start to become part of why so many are feeling left behind. 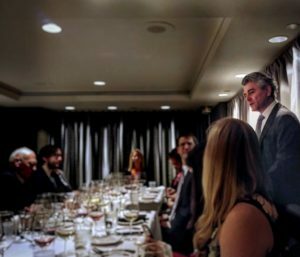 Not everyone can be a superstar with a cult following nor can everyone work for a big corporation; businesses like the ones owned by the Duboeuf family make it possible for many to keep their own business as vineyard owners while guaranteeing a certain amount of income every year. 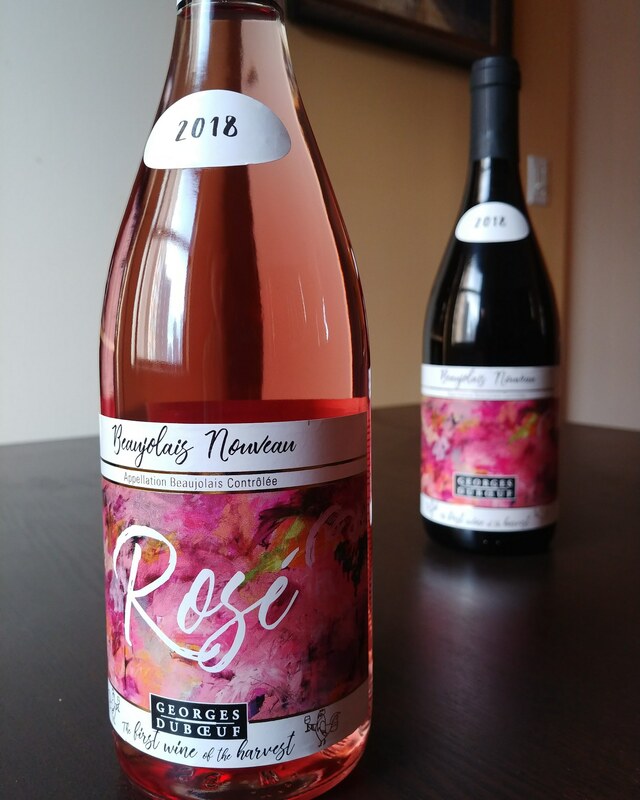 I am happy to see that the Duboeuf family is standing behind their Nouveau in the wake of sometimes snarky criticism and that they will not allow those critics to keep them from the most logical of choices, which is the rosé. 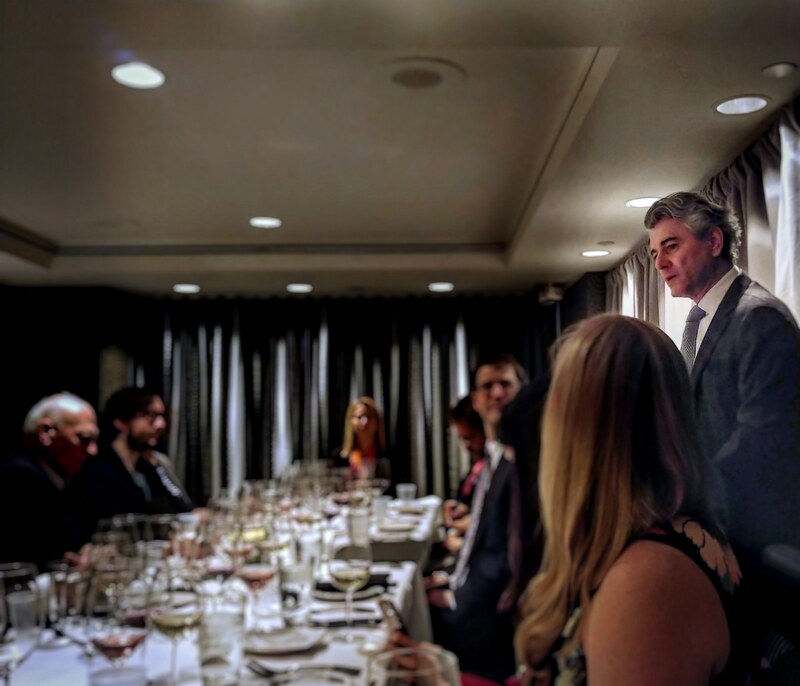 Recently, I saw Franck Duboeuf and his lovely wife Anne again for a lunch to celebrate Beaujolais Nouveau, on November 15th, with other media people in New York City. 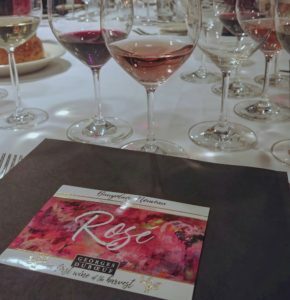 As I tasted their pretty Nouveau wines, I could not help but think how my own actions and words have contributed to an unyielding viewpoint that is in part creating this divisive world we are living in; where none of us respect an experience or opinion that is different from our own and there is simply no middle ground. I was fortunate to sit right next to Anne Duboeuf who has such an open heart and nurturing personality, and I remember how well she took care of all of us during that picnic back in September… even those harvesters that were making fun of our festive setup. I was not surprised when Anne talked about her priority for many years of having a close relationship with her three kids (who she encourages to see and experience the world while currently in their college years) and how they still do not want to be too far from her comforting presence. She was a little fearful that they won’t have a chance to find themselves, but I’m sure through time they will come into their own… but at least they acknowledge all that she does to create such a loving, accepting environment for them. Anne’s kids appreciate the special world she has created for them with her beautiful heart while they still have it… and with that thought I lifted my glass to toast Anne and the others around me with a wine that not only brings many people from all walks of life together but it gives an area of the world a means of support and purpose that would otherwise have been forgotten. Click on this link to go to post that gives tasting notes for the Duboeuf wines I tasted from the 2017 vintage. Click on this link to go to post that gives tasting notes for the Brouilly and Moulin-à-Vent Cru producers I visited in September.